The Cincinnati Bengals visit the Jacksonville Jaguars in Week 9 of the 2017 NFL season. 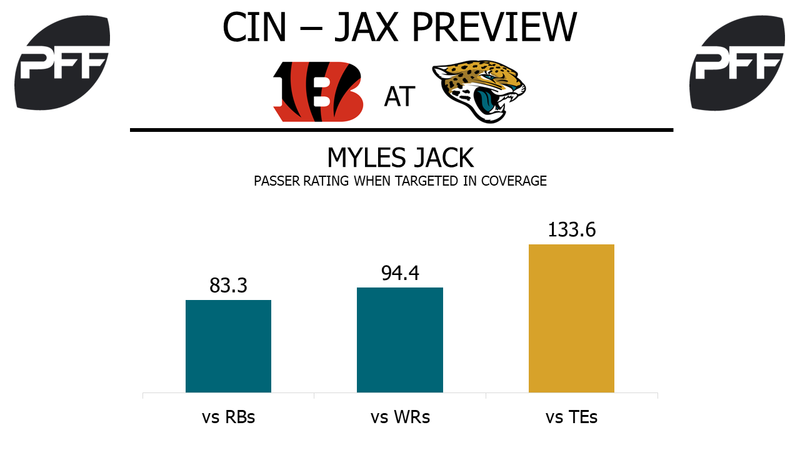 PFF previews the top player matchups of the game. WR Josh Malone vs. CB A.J. Bouye – Last week, Malone started producing to the tune of two catches for 35 yards and a touchdown on a total of 15 routes run, and he was the Bengals’ highest-graded wide receiver in the game at 77.4 overall. He’ll have his work cut out for him to keep it up this week against Bouye, the eighth-highest graded cornerback in the NFL at 87.8 overall. Only 40 percent of the targets thrown his way have been caught this season, the fifth-lowest completion percentage at his position, and his passer rating when targeted is just 41.1. T Jake Fisher vs. Edge Dante Fowler Jr. – Fisher is currently the 60th-highest graded offensive tackle in the NFL at 43.6 overall. He’s allowed four sacks, one hit and 11 hurries on 218 pass-blocking snaps, and he’s fared even worse in run blocking. 22.3 percent of his run-blocking snaps have been negatively graded this season, the second-highest among tackles with 100 run-blocking snaps. When Fisher faces off against Fowler, he’ll be dealing with one of the better pass-rushing defensive ends. Fowler’s pass-rushing productivity rating of 13.0 this season ranks fifth among 4-3 defensive ends. Two-thirds of his pass-rushing snaps have come from the left side of the defense, pairing him up with the right tackle. TE Tyler Kroft vs. LB Myles Jack – Kroft has yet to drop a pass this season, and his sure hands have helped him to a 73.4 overall grade. He’s caught 23 of his total 25 targets, the highest completion percentage for any tight end in the NFL with at least two targets. He’s only averaging 1.37 yards per route run, though, good for 21st among tight ends, and his 43.1 run-blocking grade ranks 53rd. He’ll face plenty of Jack, who has seen 18 of his 30 targets in coverage come against tight ends for a passer rating of 133.6. Jack has only forced an incompletion on one of his 30 targets, and he’s missed four tackles in the passing game. 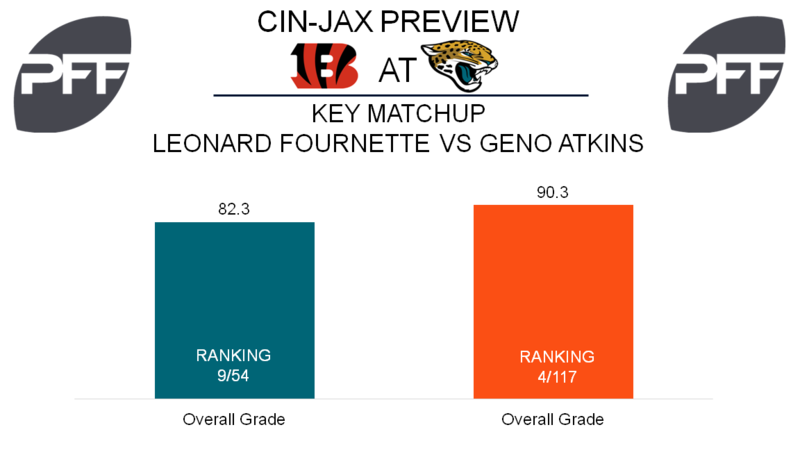 RB Leonard Fournette vs. DI Geno Atkins – Fournette is set to return for the Jaguars this week and once again figures to be the offensive focal point His overall grade of 82.3 currently ranks ninth among all backs, he has forced 25 missed tackles and is seventh in the league with 370 rushing yards after contact. Atkins has been one of the league’s premier interior presences and is in the midst of another great year with an overall grade of 90.3 that ranks fourth at the position. For the year, Atkins ranks eighth among interior lineman with a run-stop percentage of 14.3. With Fournette’s ability to create after contact and Atkins’ ability to stop runners in their tracks, this individual matchup could determine which team controls the tempo. T Jermey Parnell vs. Edge Carlos Dunlap – Despite an overall grade of 66.1 that ranks 43rd among tackles, Parnell has been a big plus for the Jaguars thanks to his pass protection. His pass-blocking grade of 75.7 is 26th at the position, while his pass-blocking efficiency of 95.3 ranks 22nd having allowed 14 total pressures on 223 dropbacks. Dunlap is on his way to another impressive season as his overall grade of 83.9 ranks 15th among edge rushers, while his grade of 86.7 in run defense ranks tenth. Despite just two sacks on the season, Dunlap has racked up 32 total quarterbacks pressures and his pass-rushing productivity of 10.9 is 11th among 4-3 defensive ends. The ability to create running lanes for Fournette and clean passing lanes for Blake Bortles make this a very important matchup for Parnell to win. WR Marqise Lee vs. CB William Jackson – With 15 targets over his last two games, Lee seems to be gaining Bortles’ trust and his overall grade of 76.1 ranks 35th at the position. Despite that, Lee’s passer rating when targeted of 63.0 ranks 75th among wideouts. After injury took away his rookie season, Jackson has really emerged of late. His overall grade of 82.4 ranks 23rd among corners, and in the past two weeks when facing Antonio Brown and T.Y. Hilton, Jackson held them to zero yards on five targets while adding three pass deflections. Considering Lee has lined up in various positions and sides this year, it will be interesting to see if teams have taken notice of Jackson, or if Bortles tries his luck against him.